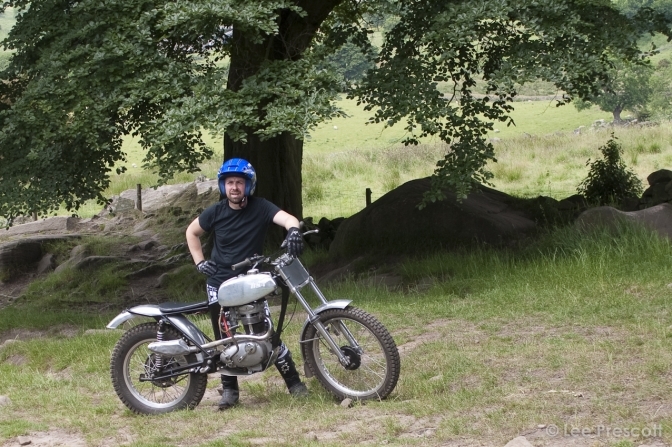 A day out in Derbyshire with the legend that is Mick Andrews. 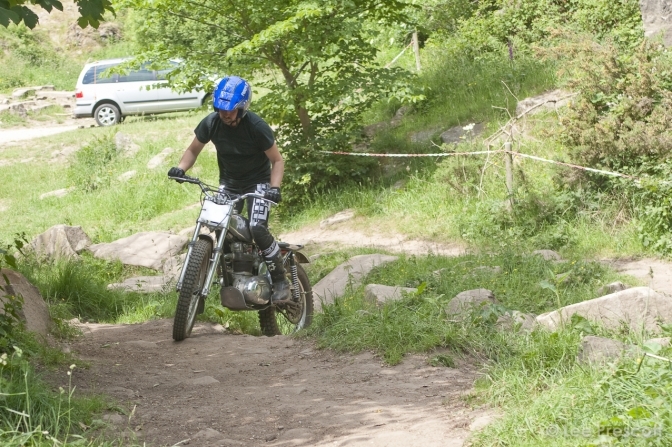 Back in June 2010 on a lovely sunny early summers day, we loaded up the Chevy people carrier with my number one Faber BSA Otter and brothers Ariel HT5 that he had not long purchased, Lee the eldest and my brother had organised a trials lesson up at Burycliffe Derbyshire. Known locally as “Mick’s Garden”. We were on the run up to the Classic Trials Show at Stoneleigh, and I for one needed a day out as I had spent the last month every day on the phone to prospective competitors and other people you have to contact to organise any event. 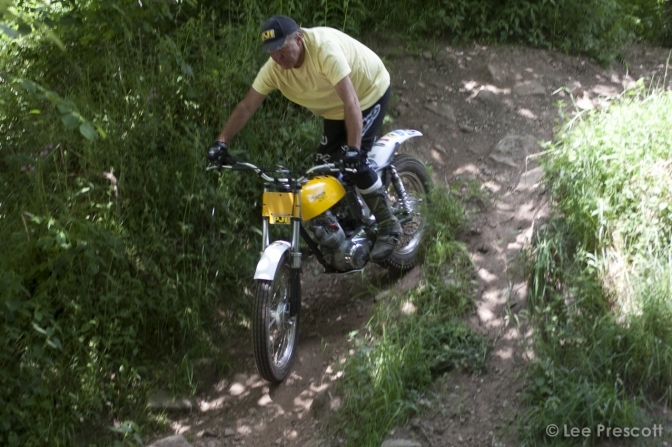 Alan Whitton was coming along to run in a new engine on his McDonald Triumph Cub he had just built. 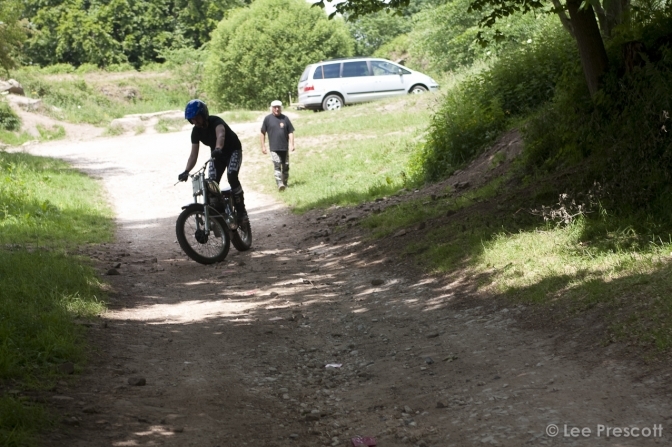 And helps Mick Andrews with his trials lesson classes when he can. We drove to Mick’s house first on that delightful day; just one of those bursts of green with warm sun you dream of all winter long.. With the sound of werring mowers on the golf course opposite in the blue morning haze we swung into his drive closely followed by Alan Whitton, Mick was just about to load the ex-works James Holland replica James onto his bike rack on the souped up Renault estate he was using at the time. After meeting Jill we followed Mick in convoy through the glorious Derbyshire villages arriving at the lane where the gate into to quarry was hidden by a tall hedge. Mick jumped out to unlock the gate and we drove slowly into the parking and “pick-nick” area. Mick was furious the lads he had let use the site the weekend before had destroyed the picnic table by setting light to it and using the wood for their camping fire..
Another nail in the coffin to use of a trials practice site. We started to check the bikes over and put fuel into the tanks. 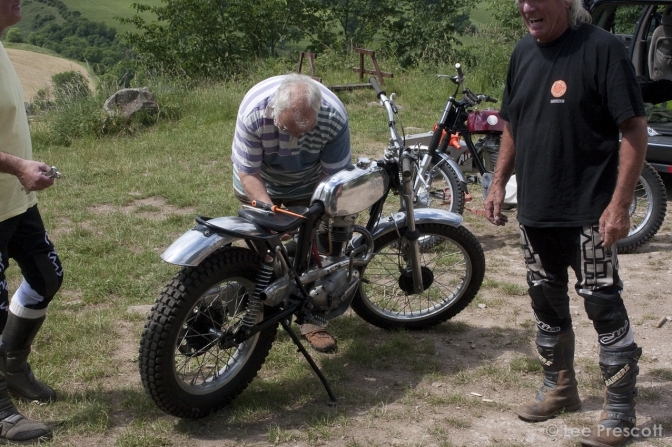 Mick with his eagle eyes had spotted that I had fitted the throttle cable to the choke side of the Amal carb by mistake. 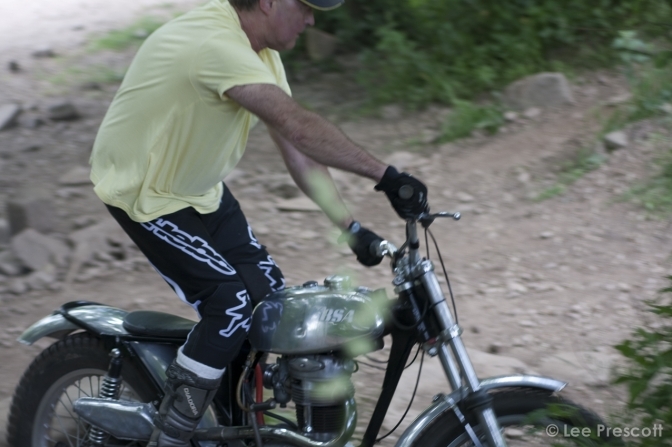 Bikes were warmed up and everyone tried a Royal Enfield that Alan had brought. Nice bike wonder what happened to it. 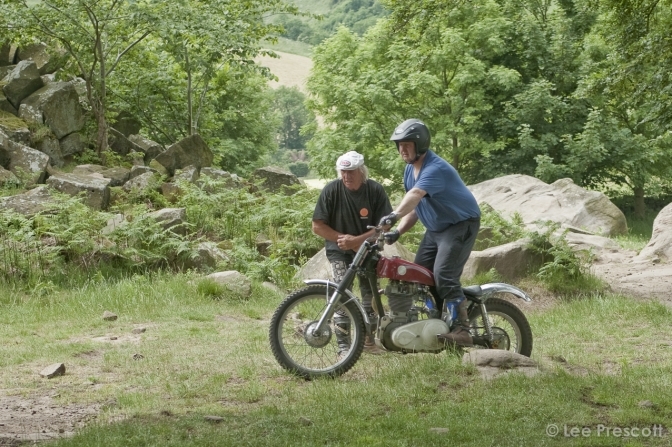 The routine Lesson with Mick is for you to follow him on his bike for a ride around the quarry, so that you can get used to the surroundings and the rocks. 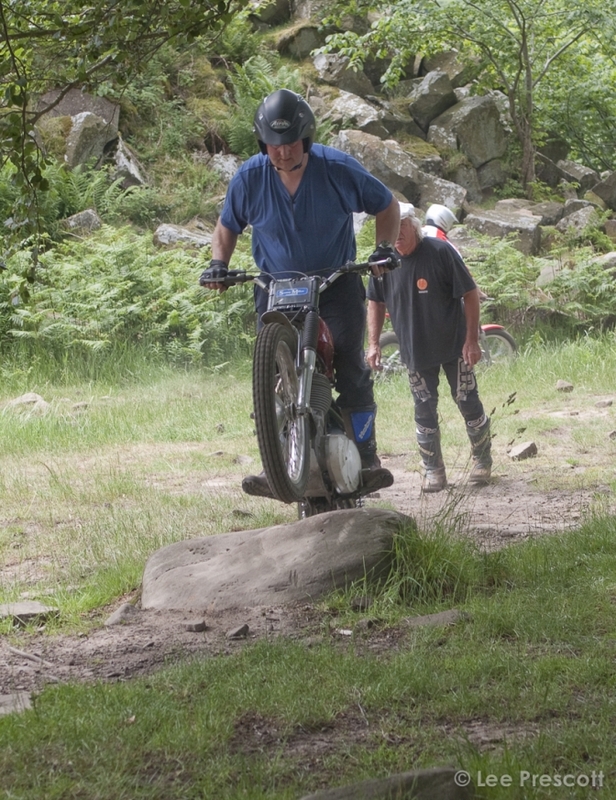 This was after of course Mick showing you how to position yourself onto a trials bike to get wheel lift using your weight back or forward and the best stance for balance… the guy just knows how to pass on the information he has gained over the years to make him number one trials rider ever in most eyes. After the run around the perimeter a few of the rocky outcrops were tried in the lower meadow. Just hitting the rocks in the middle was the way to go, and not sliding down one side that puts you right off balance. 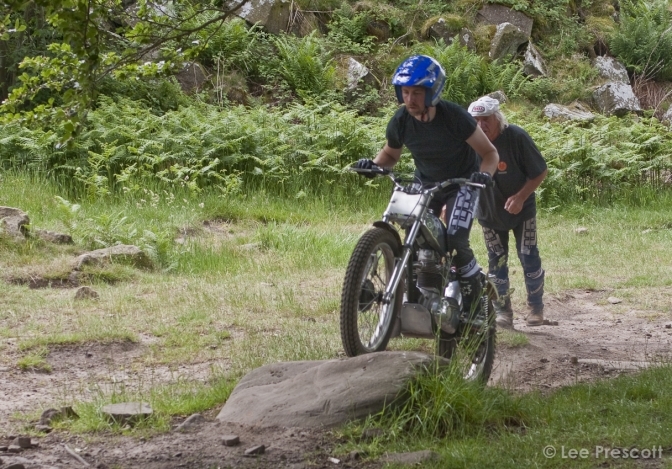 After several attempts I could see Lee was improving all the time and don’t forget he had never sat onto a trials bike ever until that day. 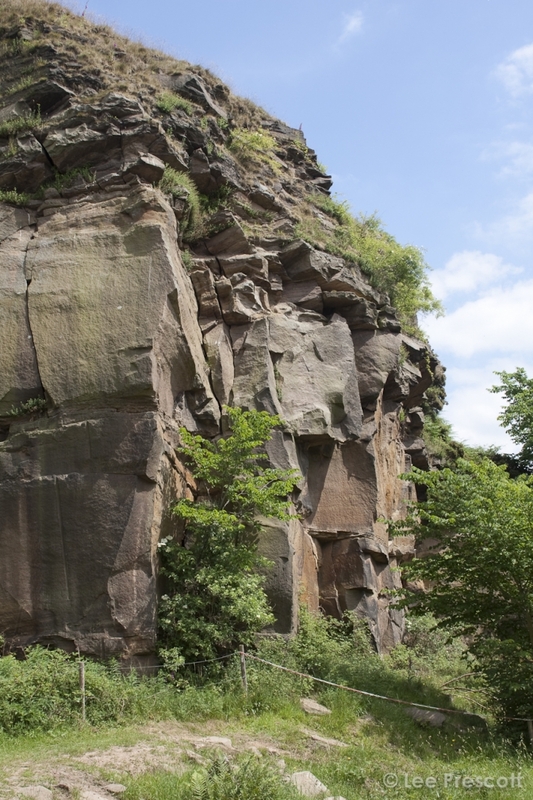 Attempts were made at several stone outcrops and most were smooth with the use over the years. 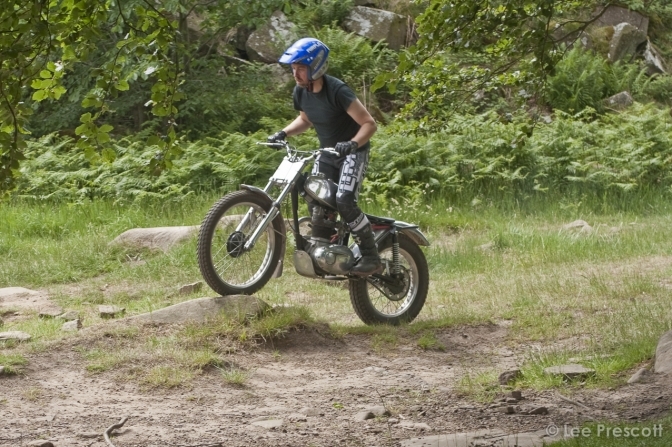 The bottom meadow is a first class place to learn the balance skills and throttle control needed to ride a trials bike. 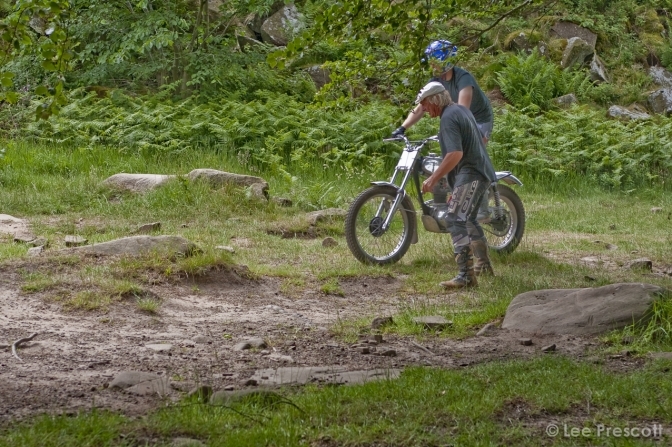 Lee now had the show to himself with the two instructors Mick and Alan showing him how to ride most tricky little sections including the uphill climb. They were both impressed how Lee had taken to the art over night. 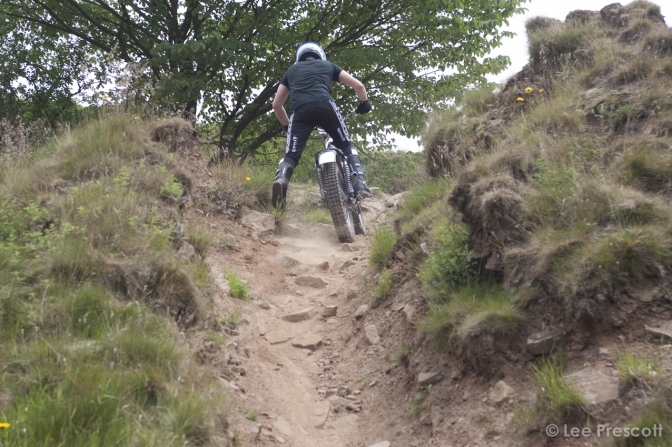 He had come from a BMX, Mountain bike background though. But the throttle response and clutch operations were both new. Eventually after a long three-hour stint the G type engine in Otter Number one, had too decided it wanted a break in the warm sun of the mid afternoon, and started to cough and splutter a bit and also got very hot. I made excuses saying the old girl had not been used to this intensity for a very long time, if ever. Lee had been around one particular section non stop for a very long time too, but was determined to clean it before he left, and with guidance and instruction from all quarters on every attempt finally got the Gold medal well he said it felt like it to him… He had now got the bug and we could not get him off of the bike for a while and eventually he even cleaned the hill section at the third attempt. After a while chatting to others that had turned up for a bit of practice and on the invite of Mick I might add, the bikes were reluctantly loaded back into their respective transport. “Follow me” Mick said, “We all deserve a drink”. 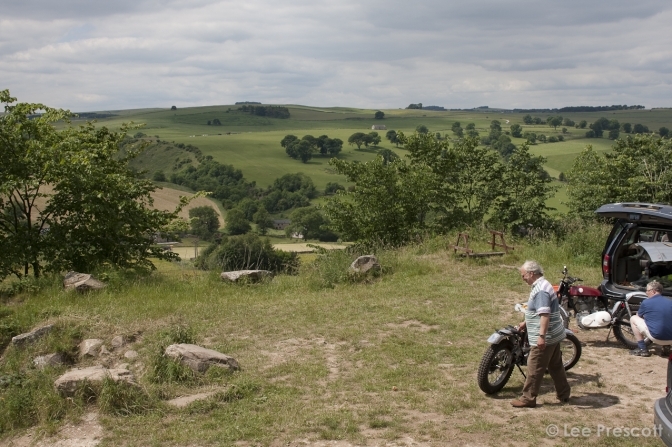 We passed through a couple of small Derbyshire villages and Mick pointed out to the workshop in one where he started to build the Majesty bikes. Just around the corner we pulled into the landmark pub “The Minors Standard”. 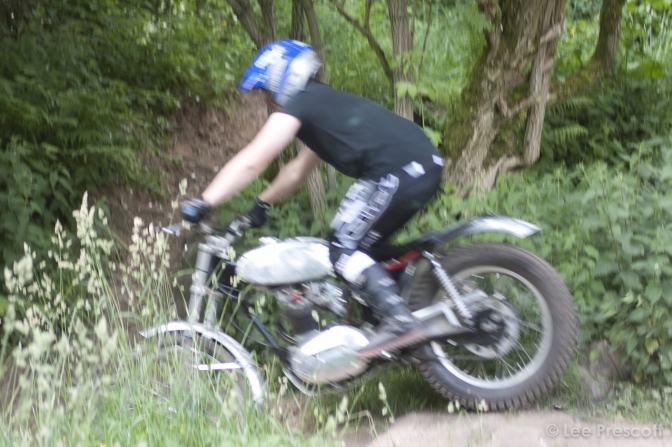 Swopping the throttle cable over. 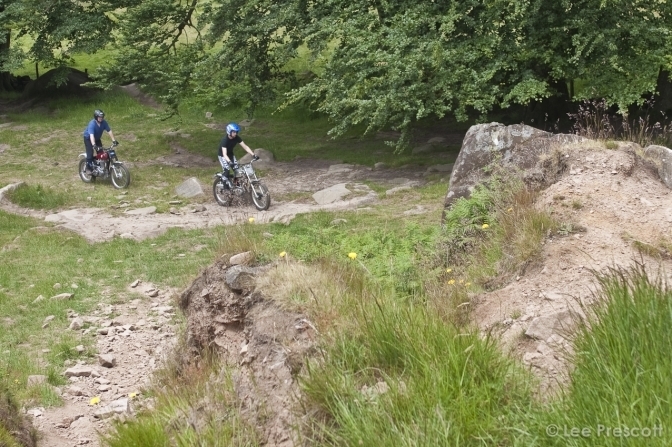 The ride around the quarry. And with the good instruction Lee manages to clean the section.